Distinctions: First recording with a symphony orchestra to sell Gold, subsequently the first to sell Platinum. The concert itself made history. The album they released of it did, too. On November 18, 1971, British rock group Procol Harum stopped in Edmonton as part of their tour. They had been considering recording in North America, and the foresight of then-ESO Assistant General Manager Bob Hunka enticed Procol Harum to the Jubilee Auditorium. Ever an orchestra to go where angels fear to tread, the ESO had previously collaborated with Canadian band Lighthouse for what had been an extremely successful show. Hunka was eager to find another group with which to collaborate. He said as much to legendary rock writer Ritchie Yorke at a chance meeting. Yorke immediately suggested Procol Harum. It wasn’t that obvious a combination. Rock had met (collided with?) symphonies before, the most famous example being the Moody Blues uniting their mellotron progressive rock sound with the London Festival Orchestra for the album Days of Future Passed. Procol Harum wasn’t art rock – not really. But Gary Brooker, vocalist and pianist for the group, was game. So was British-born ESO Music Director Lawrence Leonard, who boldly took on the role of "interpreter" for an orchestra used to the printed score, and a rock band more versed in the 16-bar blues progression. They ended up performing pretty much the entire concert twice. This was undoubtedly for the sake of the 16-track recording being made of the event (cutting edge technology at the time), cleaning up the miscues and all that. But it was also because of the response on the part of the sold-out house. “The whole show received a standing ovation so warm that the three groups (ESO, Procol Harum and Edmonton’s Da Camera Singers) elected to play almost the entire program a second time,” wrote Jon Faulds in his Edmonton Journal review. Gary Brooker wrote the orchestral arrangements for the show. “Rhythmically interesting and accompaniments that were not just note-for-note harmonies,” wrote iconic Edmonton Journal classical critic Keith Ashwell in his review of a concert even he admitted was a bit out of his depth. The songs chosen for orchestral treatment weren’t typical stuff for the band. Some of their more adventurous tracks, including a “rock cantata” In Held ‘Twas in I, were deemed more suitable than tracks like Homburg, which had topped out at #34 on the Billboard singles charts in 1967. Mind you, the group’s biggest hit prior to the Edmonton Symphony collaboration had been Whiter Shade of Pale, a song built around an organ riff taken directly from an organ prelude by J.S. Bach. So the group’s classical roots were showing, at least. 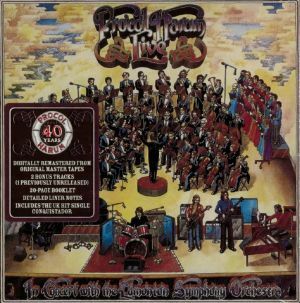 The album of the event, Procol Harum Live in Concert with the Edmonton Symphony Orchestra, was released in early 1972. It peaked at #5 on the Billboard album chart, the group’s highest placing ever. The single, Conquistador, likewise became their biggest North American hit, reaching #16. In their homeland, the song topped out at #22. But more than that, this recording made orchestral history. The album, released originally on A&M Records, became the first album with an orchestra to sell “gold.” It eventually achieved “platinum” status – again, a first. The recording has been hard to find for a while. In 2002, the German-based Repertoire label reissued the recording on CD, digitally remastered and including a bonus track: Luskus Delph, which had been recorded at the same legendary ESO concert, but not included on the original vinyl LP. In 1991, the magic came alive again, as the Edmonton Symphony invited back Procol Harum to a 20th anniversary reunion concert, with the Greenwood Singers. The hair was thinner on most of the heads, but the house was still full, and the response was warm and sincere. For one night, anyway, you could go home again. Procol Harum returned to perform with the Edmonton Symphony Orchestra and Da Camera Singers 'one last time' on November 9 & 10, 2010 to sold-out houses at the Winspear Centre.